Hello happy people! Here we are today, getting together to celebrate life. And of course, eat cake. 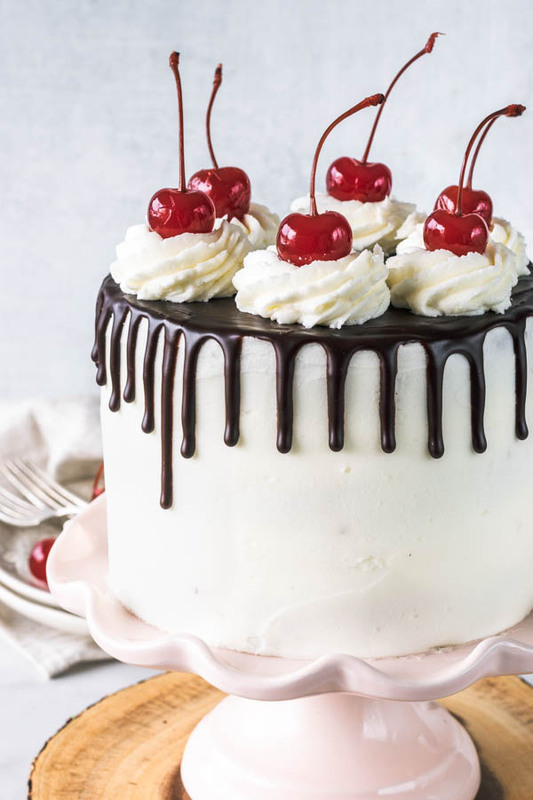 Better yet, this Vegan Hot Fudge Sundae Cake. Say whaaaat! 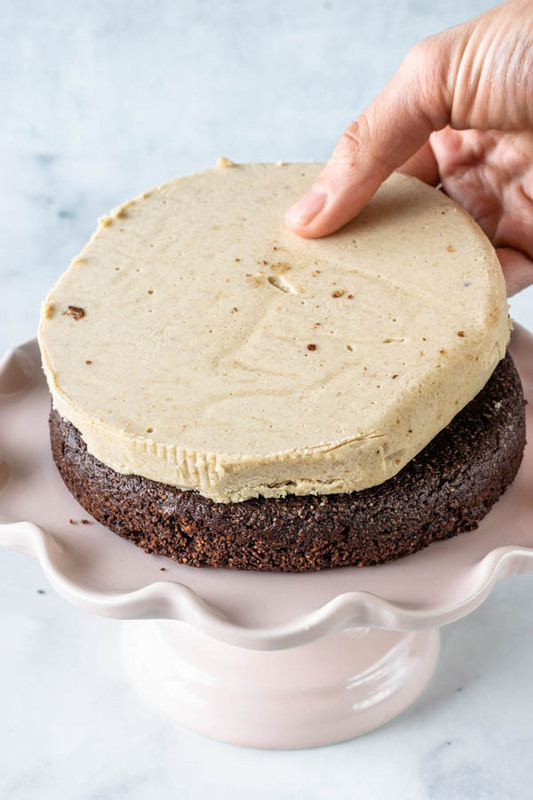 Yes, this is a vegan, paleo, and gluten-free, delicious cake! Vegan chocolate cake, filled with a vanilla ice cream filling, covered in coconut whipped cream, topped with a delicious vegan fudge sauce. 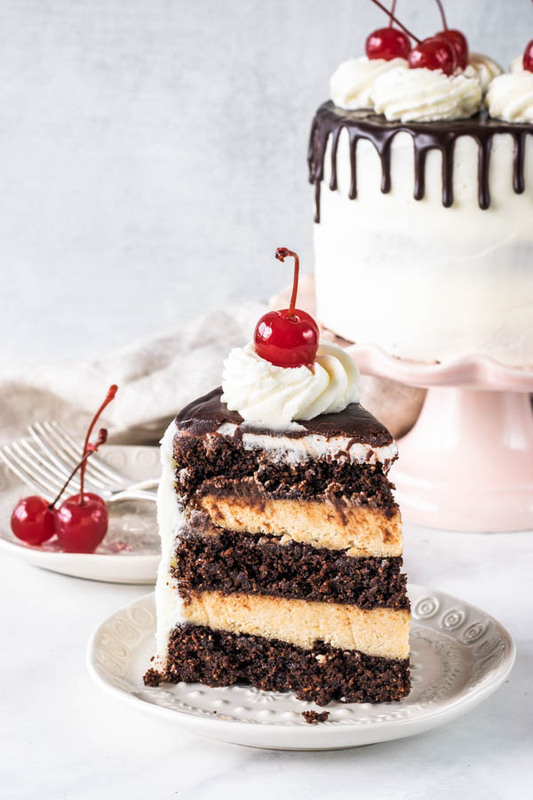 This Vegan Hot Fudge Sundae Cake could even qualify as an ice cream cake, since all elements will be beautiful kept in the freezer. But this cake will also store well in the fridge. 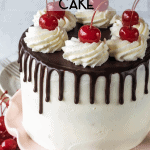 So pick how you want to serve it, as simply a cake, or as an ice cream cake! Check out that cream vegan ice cream filling. 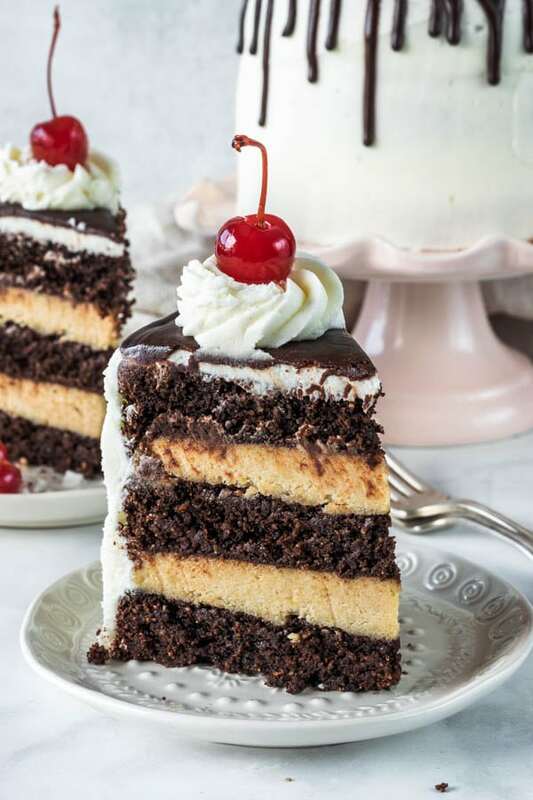 Everything in this cake is so creamy, inviting, delicious, scrumptious, and rich! 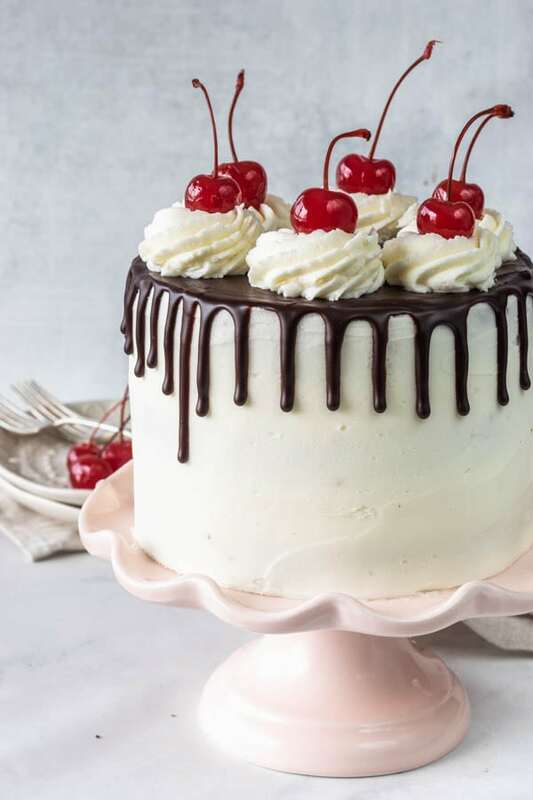 The idea for this cake came from my love for this Vegan hot fudge sauce recipe I simply can’t resist. The best hot fudge sauce I’ve ever tasted! So good, worthy of being eaten with a spoon. 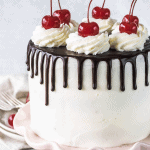 Here are some tips for this vegan hot fudge sauce, and how to pour it over the cake. The sauce can’t be hot, otherwise it will melt the coconut frosting. Also make sure the sauce isn’t too cold, or it will be hard to pour. If you don’t mind it, you can simply spread it on top of the cake too, it would give a more rustic look to the cake. If you find that the sauce is too stiff, place it in the microwave for 3 minute intervals, stirring in between, making sure not to overheat it. Or, if your sauce is too runny, you may speed up the process by placing it in the fridge for a few minutes, stirring in between to distribute the heat. 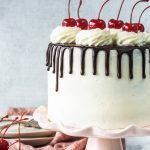 Do you like making vegan cakes? Have you ever tried combining vegan and paleo baking? It’s a true challenge to do so. And a challenge I embrace. A few tips on how to make the vegan ice cream filling. 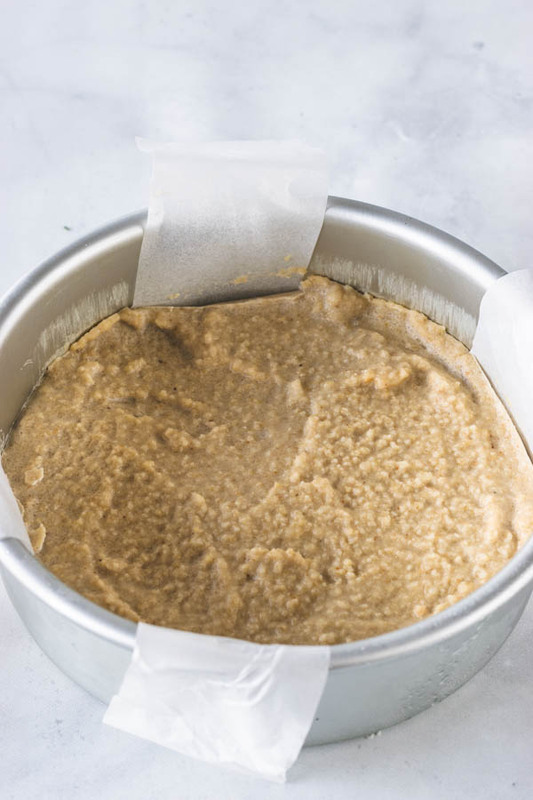 Place two strips of parchment paper crosswise on the bottom of the cake pan. Top with a parchment paper circle that fits the bottom of the pan. Pour the ice cream filling batter over it. Use a spatula to try to smooth it out as best as you can, and then place the pan in the freezer for a few hours. When ready to assemble the cake, simply use a knife to run the edges of the ice cream, and then pull the parchment paper tabs, to lift the ice cream. Remove the parchment paper from the bottom. And then place the ice cream on top of the cake layer. Top with another vegan chocolate cake layer. And repeat. I also have a few tips about the coconut whipped cream. Make sure to use cold coconut cream, chilled in the fridge overnight. Drain the cans from the water, and place the coconut cream in the bowl of the mixer. You can use maple syrup to sweeten it, to keep the cake paleo. If you don’t mind powdered sugar, use that instead. It will help also, with the consistency of the frosting, making it firmer, and easier to frost the cake with. I’ve seen some recipes online with Swerve, but have never experimented for myself, but you can find some by just googling it. Just an idea, if you want to keep this cake paleo, and also explore with different ingredients, as I always like to do. And also, please note that the coconut whipped cream frosting, when exposed, in the fridge or freezer, will start to turn to a weird color, kind of dark and grey. I recommend keeping the cake covered, if possible. 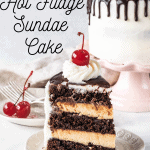 You can choose to store this Vegan Hot Fudge Sundae Cake in the fridge, or in the freezer, as it also is a vegan ice cream cake. Either way, if you store the cake in the freezer, make sure to let it sit at room temperature for a moment before serving. 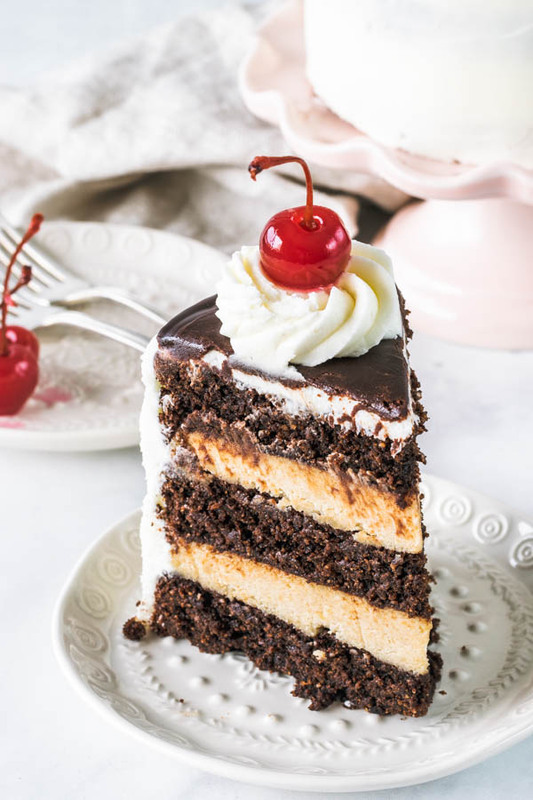 If you like my Vegan Hot Fudge Sundae Cake, and if you are more interested in seeing vegan recipes, subscribe to my email list on the side bar, to get updates of new recipes. You can check out my vegan recipes here. I really hope you loved today’s recipe. Thank you for stopping by! 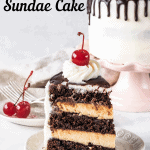 This Vegan Hot Fudge Sundae Cake will be a hit. 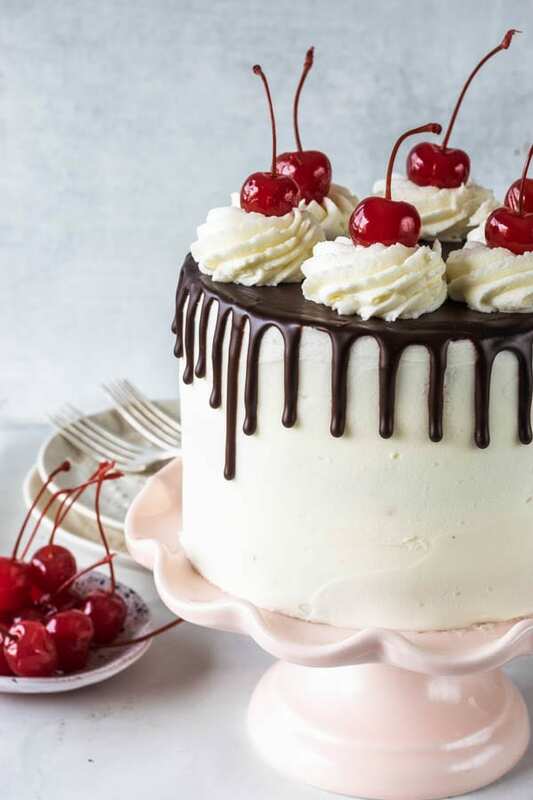 Chocolate Cake, filled with a vanilla ice cream, frosted with coconut whipped cream, topped with fudge sauce, and cherries. Also paleo, and gluten-free. Line 3 6-inch cake pans with parchment paper and grease them by brushing the pans with avocado oil. Set aside. Mix flax seeds with warm water. Let stand for 10 minutes to get thick, while you prepare the other ingredients. Sift together the almond flour, coconut sugar, arrowroot flour, baking powder, baking soda, salt, and cocoa powder in a bowl. Set aside. Mix milk, avocado oil, apple sauce, vanilla, and flax egg in a bowl. Add dry ingredients. Mix with a spatula until combined. Divide batter into the 3 pans. Bake for 20-25 minutes, rotating the pans in the oven to ensure even baking. Touch the cake with your finger, if it springs back it’s done. If it forms a dimple, means your cake needs to be baked longer. Keep checking so you don’t let it overbake. Remove cakes from the oven and let them cool for 15 minutes in the pan. Turn cakes onto a cooling rack. Let them cool completely, wrap and refrigerate them. It will make a difference to frost them while they are cold, because they will be sturdier, since this is a very moist and scrumptious cake. Soak cashews in the water overnight, or simply soak them in hot water for a few hours if you are in a rush. After soaking the cashews, drain them and squeeze them slightly in order to extract most of the water from them. Be gentle, because the cashews should be very soft after soaking. Add cashews, maple syrup, melted coconut oil, vanilla, coconut cream, and cashew butter to a food processor. Process at a high speed for a few minutes, stopping to scrape the bowl of the food processor down, in order to mix everything evenly. Once your mixture is super creamy and thick, divide between the two pans, place it in the freezer to let it get hard. Your coconut cream cans should be in the fridge overnight, so the water and cream can separate. Open your coconut cream cans and drain the water. Place cream in the bowl of a mixer together with sweetener of choice. Cream on high speed for a couple of minutes, until mixture is very thick and smooth. If frosting seems runny, feel free to add one tablespoon of arrowroot powder. If you have no problems with powdered sugar, I’d use that instead of the maple syrup, for sake of the consistency of the frosting. Place coconut cream in a small saucepan. Place over medium heat. Keep stirring until coconut cream starts to heat up. Sift cocoa powder into warm coconut cream, whisk until cocoa powder incorporates with coconut cream and mixture almost comes to a boil. Remove from the heat, add chocolate chips to the mixture. Stir with a spatula until chocolate has melted. Add maple syrup and whisk until combined. If there are still chocolate lumps, simply bring it back to the burner, with the heat on the lowest setting. And gently stir mixture until everything is melted. Don’t ever let the mixture come to an actual boil or raise bubbles. Pour smooth chocolate frosting in a bowl. Let it sit on top of the counter until it has cooled down. 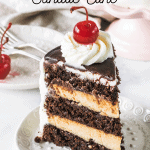 Place one cake layer on top of your cake stand, or cake plate. Remove ice cream pans from the freezer. Use a knife to go around the edges of the ice cream, to let it loose, then pull the strips of parchment paper so the ice cream will easily come off. Place one ice cream layer on top of the first cake layer. Place another cake layer on top. Repeat with the ice cream layer. Finish with another cake layer. At this point you want to let this rest in the freezer or fridge. Frost the cake. You may do a crumb coating, to seal the crumbs of the cake in. Let the cake rest in the fridge for 20 minutes. Remove from the fridge and then frost it again with a thick layer of frosting. While the cake is in the fridge, also place the frosting in the fridge. Give it a little whisk once you remove it from the fridge, to make it creamy again. Also, keep the frosting covered at all times. 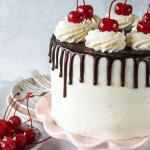 After frosting the cake with the whipped Coconut cream, you can let it sit in the fridge or freezer, so the frosting will harden up. Make the fudge sauce and let it rest until it comes to room temperature. Pour over cake. 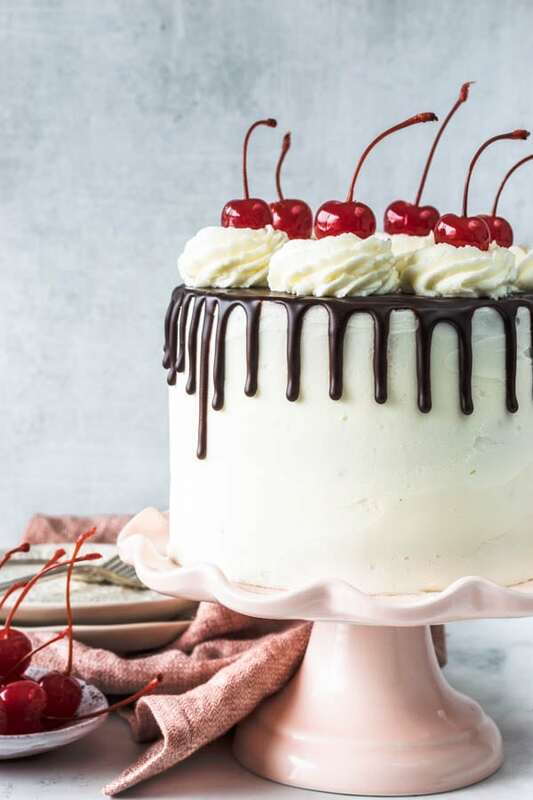 If you want the drip effect, you may have to use the fudge sauce while it is still slightly warm, but not too warm that it will melt the coconut cream frosting. Also, if the fudge sauce got too hard, you can always heat it up for like 3 seconds at a time on the microwave, until you achieve a better consistency. 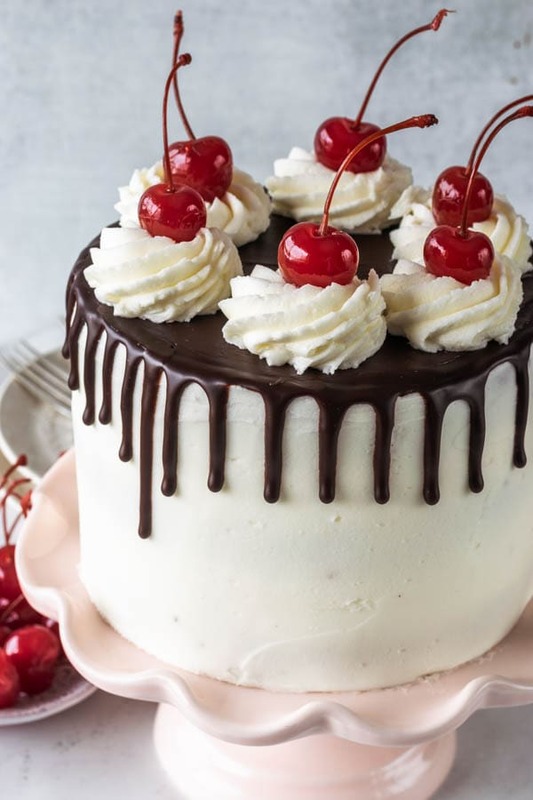 After spreading the fudge sauce on top of the cake, let that set, and then pipe some coconut whipped cream on top, and top with cherries, if desired. Keep cake in the fridge, covered for up to 5 days. In the freezer might store for longer. Make sure the cake is well covered, though. 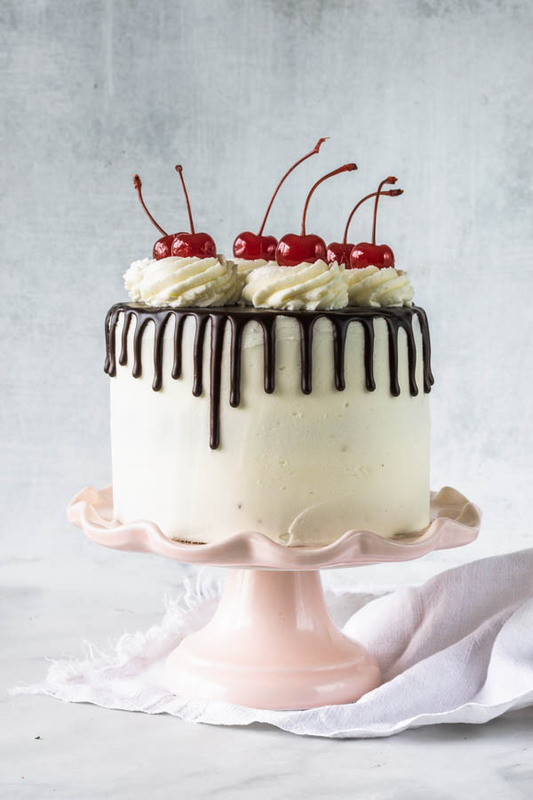 You can use powdered sugar, or another type of sweetener, being mindful the recipe might not be paleo, or refined sugar free any longer depending on what you sub with Also, be mindful that the maple syrup might affect the final texture of the frosting. The more maple syrup you add, the more liquid the mixture will be. If you add any powdered sugar, and I’ve seen people online having great results with Swerve, your frosting will have a better consistency. I haven’t experimented with Swerve yet, so I can’t speak for the taste. Omg yes coconut cream and coconut milk are the best in vegan desserts!! I super agree!! and coconut oil, and coconut butter, and coconut flour, and coconut powdered milk ahahha you see where I am going! Wow this is such an impressive cake, even before you said it was both vegan and paleo. You truly are the queen of these amazing special diet cakes. Loving the flavours too. Just beautiful. why thank you Marie. That means a lot to me! WOW this cake is absolutely stunning! Perfect for special occasions!